The Giant Schnauzer is 'a bold and valiant figure of a dog,' according to the American Kennel Club breed standard, and this is not hyperbole. This working breed cuts a striking silhouette and has a bold, self-assured demeanor. Their prominent eyebrows and beard give them a look of elegant distinction. They were originally bred in Germany to work as farm dogs who could drive cattle to market and protect the livestock. The breed needs early socialization to minimize the possibility of aggression towards other dogs. The largest of the three Schnauzers—Giant, Standard, and Miniature—the GS is alert and commanding, playful and exuberant. Giant Schnauzers are strong-willed and powerful—a confident owner who can manage them with patience and firmness is their ideal match. In the past, Giant Schnauzers have also been called Munich Schnauzer, Munchener, and the Russian Bear Schnauzer. 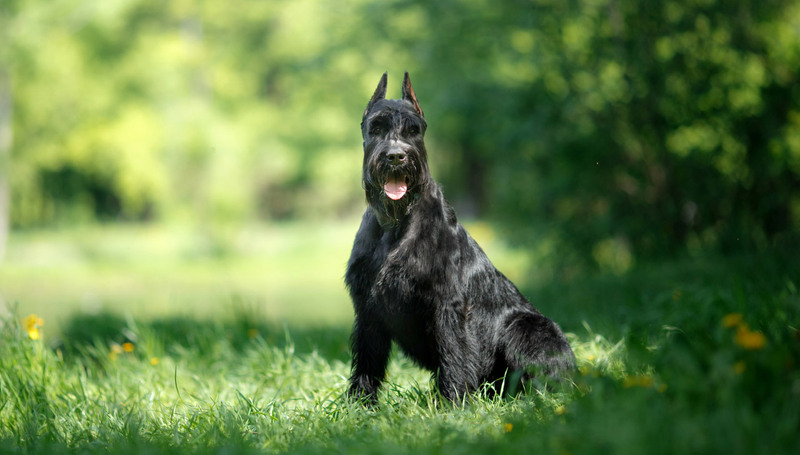 Coat - The Giant Schnauzer's coat is hard and wiry. They have a soft undercoat and a dense, harsh outer coat that stands a bit off the body. A wiry beard and eyebrows are distinguishing Schnauzer characteristics. The coat colors are a solid, pure black, or pepper and salt, which consists of banded black and white hair that creates a deep, medium-gray shade. The pepper and salt variety has a darker facial mask and lighter eyebrows, whiskers, and cheeks. Giant Schnauzers closely resemble Standard Schnauzers, just in significantly large form. They are square of frame, with a strong, arched neck, and rectangular head. The GS is sturdy and muscular, and moves with a vigorous, driving stride. Their high tails are docked when meeting the AKC standards. Their expressions are alert and intelligent, and they have a courageous and watchful bearing. A wiry beard and eyebrows are distinguishing characteristics of the breed. Giant Schnauzers are loving and loyal to their families, and would play with them all day if given the option. The GS is native to the Bavarian region of Germany where they were originally developed to drive cattle and, later, to work as guard dogs in breweries, butcher shops, and stockyards. Their exact ancestry is unclear, but it is thought they evolved from crosses between rough-haired Sheepdogs, Great Danes, Bouvier des Flandres, and the Wirehaired Pinscher, among others. Most importantly, the resulting dog was strong, smart, and had a coat that protected them from rough working and weather conditions. The breed's popularity grew after it was trained as a police dog during World War I. Today, Giant Schnauzers are used as police and guard dogs, in search and rescue operations, and as therapy dogs. The first Giant Schnauzer club was formed in the US in 1962. Giant Schnauzers are lovable with their family members and a little reticent around strangers, though they will warm up in time. The GS tends to be quiet, though they will bark if they hear or see anyone encroaching on their territory. Their intelligence and high energy make boredom a risk when they aren't kept occupied and given adequate exercise. Are Giant Schnauzers Good with Kids? Giant Schnauzers are generally patient with kids from their own family. Because they are big and boisterous, however, they aren't ideal for families with very young children. The GS should be watched closely with all kids, but especially with tykes they don't know. Are Giant Schnauzers Good with Other Pets? Giant Schnauzers are known to be aggressive towards other dogs, cats, and small animals, and it's ideal if they are the only animal in the household. It's very important that they are socialized from a very early age to remain calm when strange dogs approach. Giant Schnauzers are highly protective of their people, themselves, and their territory. Are Giant Schnauzers Good Guard Dogs? Giant Schnauzers were bred to be guard dogs, among other things, and they retain that skill to this day. They will bark loudly to alert the household to possible danger, and will be aggressive towards any interlopers on their property. The GS is an exuberant, energetic dog who requires several hours of vigorous exercise each day. The Giant Schnauzer is bold and strong-willed. May be aggressive towards people and dogs they don't know, especially without adequate socialization when they are young. They require experienced owners who set firm, consistent boundaries. They get bored easily and need active owners who have the time and energy to keep them busy. Tend towards destructive behaviors when they get bored. Coats require clipping or stripping, in addition to regular brushing. Indoor Giant Schnauzers are very attached to their families and don't adjust well to outdoor living, so they should live indoors. Their hypoallergenic coat doesn't shed excessively, so fur is not a big concern with the GS. Because of their size and energy, apartment living is not ideal. Outdoor Giant Schnauzers should spend several hours outside each day engaged in dog sports, running, and activities with family members. The yard should be well secured because the GS will find a way out in search of adventure, even when closely watched. Exercise A healthy GS requires several hours of physical activity each to remain fit. They are excellent candidates for challenging dog sports of most varieties. Endurance Giant Schnauzers are working dogs who have the stamina to go from dawn until dusk. Running Miles: Giant Schnauzers will run with you for five miles and more. They make excellent exercise partners for running and biking. Hiking Miles: The well-trained GS makes an excellent hiking partner and will handle a 10-mile trek with ease. It's important that your Giant Schnauzer is fully leash trained before hitting the trail. Food Generally, this breed requires about four to five cups of good quality dry dog food each day, given over the course of two feedings. This will vary, however, based upon your Giant Schnauzer's activity level and age. Talk to your veterinarian about the optimal diet and quantity of food for your GS. Alone Time An independent dog, the Giant Schnauzer can be left alone for a few hours at a time. Beyond that, however, you risk a bored GS, which can result in destructive or nuisance behaviors such as barking and digging. Beyond a weekly brushing, the Giant Schnauzer's wiry coat requires regular clipping or stripping. This can be done at home, or with a groomer who has experience working with the breed. Wash your Schnauzer's ears weekly with a gentle, dog-friendly cleanser to prevent dirt buildup that can cause infections. The GS should have their teeth brushed several times a week, and their nails trimmed every month or so to prevent cracking. You can minimize serious health concerns in a Giant Schnauzer by purchasing from a reputable breeder who engages in responsible breeding practices, and through screening for common diseases and conditions. Smart and eager to please, Giant Schnauzers are fast learners and will ace the beginner commands in no time. Because they are so energetic, training the GP should be done in between exercising and play so they are more likely to remain attentive. Continued training is important for this active breed that bores easily. Giant Schnauzers will happily participate in herding, carting, agility, or advanced obedience training and contests—or all of the above. Giant Schnauzers are bred for herding rather than hunting. Yes. Giant Schnauzers are one of the largest breeds considered hypoallergenic. Their wiry coats don't shed heavily and, as a result, pet dander is less abundant in your home. Regular grooming of your GS can further minimize pet dander. No dog is 100 percent hypoallergenic. No. Giant Schnauzers are considered working dogs. Their miniature cousins are classified as terriers, however, which has led to some confusion. Miniature Schnauzers were bred specifically to hunt vermin, which is a terrier trait, while Giant Schnauzers were bred to herd and guard. It's also common for people who want a large hypoallergenic dog to find themselves choosing between Giant Schnauzers and Airedale Terriers, with whom they share a square body shape and rectangular head. Giant Schnauzers can learn to swim and many of them enjoy it. Just like people, dogs are unique in their likes and dislikes, so introduce your GS to water slowly and don't force it. All dogs should be watched closely while swimming.